We all know how necessary it is to have a plan when visiting a city, especially if you don’t have much time but still want to make sure you see as many places as possible. To make it easy for you, here are some tips on what to do in Rome that will help you make the most of your trip. With so much to see and do, the first trip to Italy can be intimidating. You want to visit the most important historical places, you want to admire the world-famous artwork, you also want to experience it like a local. Try the Iconic Italy tour with GAdventures for a two-week exploration of the most important and iconic places that you can’t miss on your first trip. From Venice to Florence, from Rome to the Amalfi Coast, you will have a full Italy experience that will make you long for more! Wherever you are coming from and how long your flight is, once you land you will be tired and will likely want to get to your hotel as soon as possible to rest, take a shower and drink or eat. In order to do that, make sure you arrange a taxi ride prior to your arrival to avoid the queue in front of the exit where is the public taxi service. We arranged our ride with Blacklane taxi company and I can recommend their services as they are very professional, on time, have affordable prices and regardless of your flight delay time, the driver will be waiting at the airport holding a sign with your name on it (or with whatever you ask). Their service is easy to book online and you will receive an email at every step, booking, the name of the driver and even when the driver arrives at the airport. The first thing to do if you are travelling on a shoestring is to rely on the public transport and get some bus/metro tickets, cheap and can be used also for the trains inside the city. Try to avoid rush hours and school closing times if you don’t want to go crazy. Following these small precautions, you are going to find it efficient. Keep in mind that depending on your nationality you might need to register at the nearest police station within the first 8 days of your arrival in Italy. Usually, hotels will do this for you, so you need to do it by yourself only if you are renting a flat or staying at friends/relatives. Normally you will be told about this when you apply and receive your visa. While in tourist areas you will find people speaking some English, if you go a bit far from the most popular spots English is seldom spoken so you better either learn some Italian basic phrases or carry with you a small dictionary (we will be posting some Italian tips soon so stay tuned!). When well rested and fed, you will surely want to get out and enjoy some of the most historical and amazing places that still exist on earth, so read on for some tips on what to do in Rome in the first days. 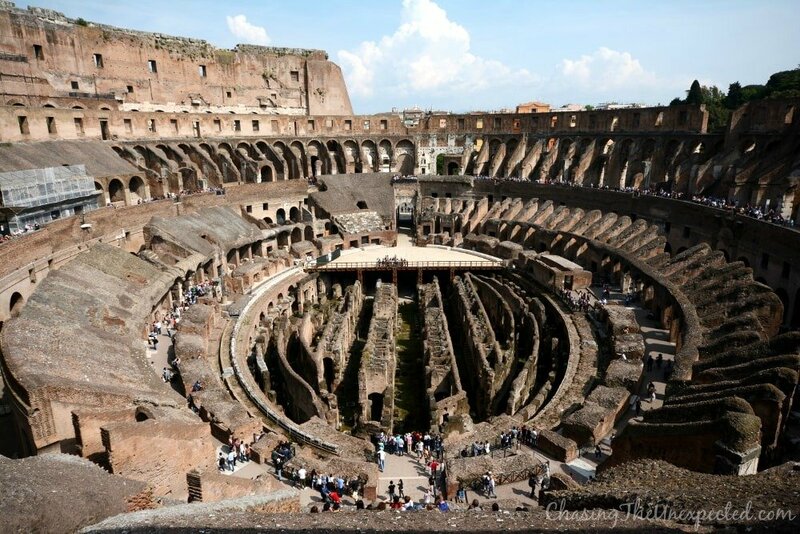 We all have either read or heard about the Roman Gladiators, so among the first things to do in Rome there sure is their Colosseum. Make sure you arrange your visit early morning or even book online first in order to avoid huge queues. Between the Colosseum, the nearby Roman Forum, and dozens of street artists painting the historical buildings even adding names and shapes upon request, your morning will fly. If you want to get an original gift for your loved one, one of those “tailor-made” paintings do make for an original idea. After enjoying the beauty of Colosseum, head to the Baths of Caracalla where you will be taken back to Ancient Rome and their love for spa and pampering themselves. Round off your historical tour by walking along the Imperial Fora Road (Via dei Fori Imperiali) to see where emperors and orators made their speeches from. If you are still wondering what to do in Rome, on the second day, head out to Piazza Flaminio (Flaminio Square), near Flaminio metro station (line A) and right below the Pincio terrace of Villa Borghese city park. Obviously here you will join hundreds of tourists from across the world, regardless which season of the year it is since Rome is always packed with tourists. Full of historical buildings and statues around each corner, in Rome you literally get lost in history. From Piazza Flaminio walk down Via del Corso, one of the most exciting shopping streets of the area where you find both expensive and more affordable prices albeit still of good quality. Walking along Via del Corso towards Piazza Venezia you will reach Piazza Montecitorio, where is the palace of the Italian Parliament, and further inside, the beautiful Pantheon and the huge Piazza Navona, the square built on top of Domitian Stadium that hosts Bernini’s Four Rivers’ Fountain and Baroque Santa Agnese in Agone church. Along the way please don’t forget to get some Italian gelato. Close to the Pantheon you will find Giolitti, very famous ice cream shop that always stands out for its long queues, but if you ask me, choose GROM, the nearby gelateria (one is in Via della Stelletta and one in Piazza Navona itself), as they always use very high quality and season ingredients, the best treat to round off a long but rewarding day! Curious about more things to do in Rome? Check out our blog entirely focused on living and enjoying the eternal city! I am the most obsessive-compulsive person when it comes to planning a travel. I love the practical tips you shared, especially since it is easy to get overwhelmed when traveling a popular tourist destination like Rome. I’m glad you like it Abigail. Traveling around Middle East, living between Afghanistan and Italy (Rome and Sardinia) I understand how overwhelming it can get when traveling. The more you travel the more you want to make sure things are planned, specially if you don’t have much time and want to visit as many places as you can in a city packed with tourists 24/7 all seasons like ROME. What about the Vatican (St. Peter’s Basilica and the Bernini Colonnade? Angelo which is not that far from the Vatican. I know there are waaaaay more places and things to do in Rome but that is what I did in two days and wanted to be honest with the readers. I have been here in Italy (Sardinia and Rome) for weeks and there are still places I haven’t visited, Rome is packed with historical buildings and sites to visit. I appreciate the tips though. This is a perfect guide for a citybreak in Rome, or for a short geataway. Thanks for sharing! Lots of things are there to do but choosing the right thing to do… this is too important & this article helps me to choose right thing to do.